We have come up with an extensive market research study on roller screws that covers detailed analysis of the entire market by considering various market segments and their respect market scenario across the globe. This intriguing research report can assist the reader in slating all possible strategies based on valuable insights in order to maintain the much needed tempo with the changing dynamics of the market in the present scenario as well as few years down the line. Global roller screw market research study focuses on various opportunities, trends, drivers and restraints across key geographies in the globe. This delivers a global perspective by covering all the key areas presenting a holistic view of the market. This assists the reader to get a detailed understanding about the regions with optimum potential in order to slate investment decisions and expansion strategies. The research study eliminates all the biasness giving a more realistic shape to the market acumen. Credibility of the researched data and statistics lie in the uniqueness of the research methodology which ensures higher accuracy. In-depth assessment of the global roller screw market is underpinned by an extensive research process that includes both secondary and primary research to obtain relevant numbers. The data collected undergoes several funnels of validation and re-examination at each step, as the research progresses. This ensures delivering value with data having higher degree of accuracy. The expert opinions of the market observers and the domain experts is extrapolated and triangulation of these enables the analysts to arrive at a much accurate global market representation. The comprehensive research report on global roller screw market provides valuable insights with weighted analysis. Every organization has its own integral research team, which strives to gather sufficient research data of the market. Persistence Market Research aims at doing all the heavy lifting by providing unbiased insights which can be actioned by the research team thus supporting in achieving their research milestones. The research report on global roller screw market involves a separate section which focuses on the key players and the competition standing in the global market. The section involves the strategies applied by the key players, their product portfolios, their innovations, developments and product evolutions, their area wise spread and future expansion plans, the mergers and acquisitions taken place, the market shares and revenues of these tier players, financials, key personnel, etc. This intelligence dashboard completes with the inclusion of the analysis of the various aspects of the key competition in the market. Competitive assessment has been done in a systematic way to enable the reader to draw necessary conclusions. 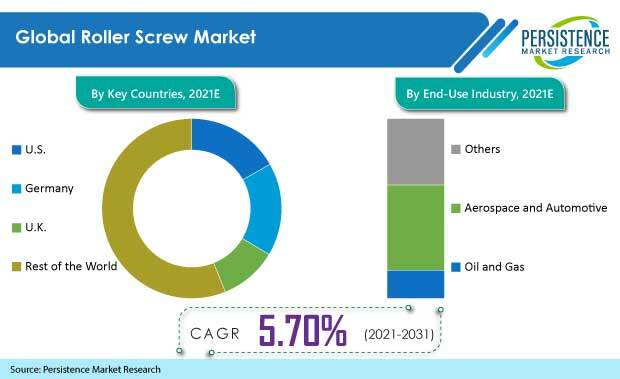 According to this research report, the global market for roller screws is expected to witness significant growth during the period of forecast. The global market for roller screws was valued at around US$ 205 Mn in 2017 and is expected to reach a value of more than US$ 335 Mn by the end of the period of forecast (2025). During the period of assessment, the global roller screw market is projected to expand at a value CAGR of 6.4%. This growth can be attributed to the increasing use of roller screws in electric aircrafts where they are used as actuators that convert the rotary motion of the aircraft into linear motion. Also, increasing focus on electric vehicles, increasing demand for robots across industries, growing automation in the automotive sector to enhance vehicle efficiency and growing use of roller screws in oil and gas industry have contributed to the growth of the global roller screw market. The market for roller screws is highly competitive. Several small players are investing in this market and are struggling to gain hold on the market by consuming substantial market share. These players are striving to tap new revenue pockets across the globe with a view to expand business operations and reach high level prospects in different end use industries. OEMs are focusing on automated production systems in order to enhance the product and service quality. This has pushed them to produce compact systems that consume less space. Roller screws are widely used in automated assembly cells for various operations that need repeatable and precise linear motion, for instance operations such as riveting and welding. This is expected to present lucrative growth opportunities with respect to roller screw adoption in the coming years. Roller screws are used as electromechanical actuators in order to carry out pressing applications in vehicle manufacturing. They are widely used in robotic welding guns during the manufacturing of chassis of cars. Electromechanical actuators driven by roller screws are effective solution to meet the ever rising demand of production in the automotive sector. The automotive segment is the most lucrative end user segment and is expected to grow at a value CAGR of 5.2% during the forecast period. In 2017, this segment was valued at about US$ 71 Mn and is anticipated to reach a value of more than US$ 100 Mn by the end of the year of assessment, 2025. This segment dominates the global market with respect to value as well as volume throughout the period of forecast. Aerospace industry has been witnessing steady rise since past years. Roller screws are used for critical embedded actuation applications like flight controls. The aerospace end user industry segment is the fastest growing segment owing to increased adoption of roller screws as electromechanical actuators in this sector. The aerospace segment is projected to grow at a high value CAGR of 7.8% during the period of assessment.